Today I was walking through Eindhoven and I spotted a few trends I wanted to write about. Looking in the shop-windows it didn't really seem to matter what you are going wear this fall as long as you use some uncommon fabric. If it's leather, fur, sequins or animal/aztec print you can go totally wild this fall ! The grunge look is back this fall, spotted on different runways ( Saint Laurent, Dries van Noten, Phillip Lim). Most bloggers have picked it up starting with checkered print and cut out boots. But lets not forget the leather jackets and pants, which were also a real hit last year. You can find a checkered shirt at almost every shop, like zara. They also have a really nice checkered coat this season ! I have seen them everywhere ! 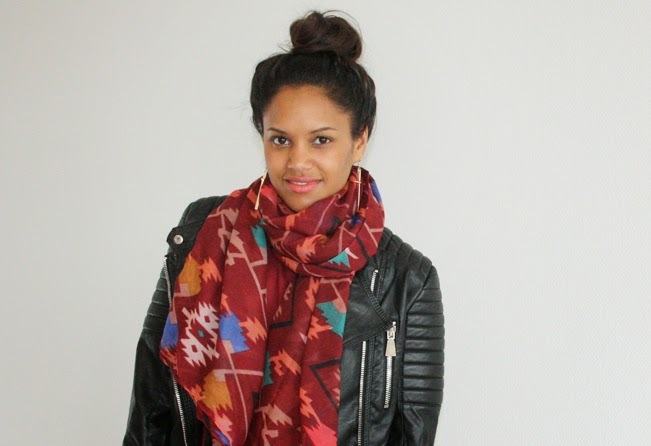 In all the small webshops I know you can find a big aztec-printed scarf in every color you can imagine. Personally I'm not a big fan of this trend, but I might grow to like it.. I do like big scarfs which you can wrap around like 10000 times, hmm so cozy. Yeah you can read it, the skort is here to stay ! But I've also seen allot of draped skirts, which actually got the same look as a skort but then it's really a skirt. I think this is a nice trend, because I'm not really a girlie kind of girl anyway.. and I think a skort looks allot tougher then a skirt. Some more trends who will keep hanging around this season are the sneakerwedges. Which blogger haven't you seen in them ?? And yes, even I own a pair or two.. Ofcourse the Isabel Marants are the most wanted but there are brands who are a bit more, uhm affordable. Also you will keep on seeing studs on your clothes and shoes because they aren't going anywhere soon either. Which is a good thing for everybody who did a DIY with studs on their stuff, because you can stay very fashionable this way ! That's it for now ! EnJoy your weekend !